Hey guys! Have you ever put a product on your “to try” list and then just never get around to buying it or trying it out? Me too. Today’s post is going to be featuring a product that I’ve been desperate to try for so long but just never got around to doing so. Not anymore, though! Unless you’ve been living under a rock, I’m sure that you’ve heard that Korean beauty products are pretty darn good. In fact, the whole idea of a BB Cream or CC Cream is Korean and it was adapted into the Western world. Therefore, trying a Korean BB Cream has to happen. 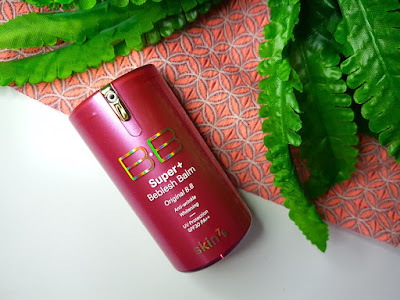 Skin79 is a brand that I have actually tried products from before, but one of their BB Creams in particular has been drawing my attention for years: the Skin79 Super+ Beblesh Balm in Hot Pink. Having oily skin that is prone to break outs and also being a mum who is on the go from the second she wakes up to the second she gets to finally fall asleep every day, finding the time to do a full face that covers what I need it to cover and also stay put can be a challenge. A BB Cream adds a whole new layer of flexibility and time saving to any routine, boasting skincare and makeup benefits into one product. This particular product has a triple-function formula that promises to protect, smooth and brighten the skin. It absorbs excess oil, corrects uneven skintone, fights dullness and also contains UV protection SPF30 PA++. On top of that, it boasts high coverage to leave the skin looking flawless. That’s a fair amount! I’m also pretty sure that you can see why I was so eager to try it out, too. So when I was running low on foundation and started browsing around to decide which to try next, I remembered this and thought aha, now is finally the time to try this one out. It comes packaged in a bright, shiny pink, opaque bottle with a pump lid. It has some pretty holographic elements on the logo too, and it holds 40ml of product. The cream itself is pretty thick, beige and it smells a lot like sunscreen. I personally find that this applies better over a primer to avoid it sinking into any fine lines. I have been using the Wonderland Studio Finish Primer (review of this will be coming soon) and I find that they work well together. As you first apply it, it does look a little pale and a bit grey, but it does quickly adjust well to your natural colouring. No worrying about whether or not you bought the perfect shade! It just adjusts to your actual skin tone. This is where I want to talk for a second about how it may work on darker skin tones. This product is described as being “whitening” and also when you first see the cream itself it is a beige shade. Therefore, it does sound like it could be the wrong type of product for those with darker skin. As I have really fair skin and can’t really answer the questions you may have, I instead did a search and came across this video review which discusses this same product on darker skin tones. The comments section also provides an answer from Skin79 regarding the “whitening” element and that says: "Whitening is a term for saying that, this has whitening effect, that will help lighten your uneven skin tone". I hope that’s helpful in some way! 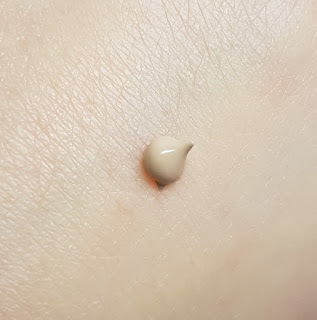 The coverage of this BB Cream is incredible. It has the coverage level of a medium/full coverage foundation, but it applies like a tinted moisturiser. You can actually use your fingers for a quick application and it doesn’t cake up or leave any streaks (as long as you rub it in properly). If you don’t want to use your fingers though, you can still apply it in other ways as you would your regular foundation, such as a sponge, foundation brush or even a stippling brush. My personal preferred method with this cream at the moment is to apply it with my fingers like I’m applying moisturiser, then buff it with a stippling brush for an extra level of flawlessness. 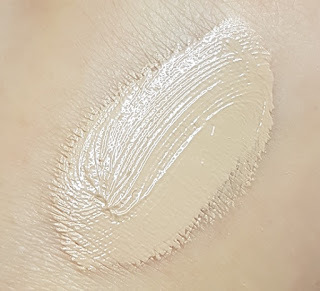 For comparison purposes, my preferred method for applying foundation is with a blender sponge, and yet I find the fingers/stippling brush application of this cream gives me a finish that I’m happy with and also takes far less time. I find that this Beblesh Balm does leave a glow on the skin. However, thanks to the high coverage and oil absorbing aspect of it, it looks more like a healthy glow, and that’s fantastic. It’s a whole different ball game to that oily skinned look. This is more like photoshop in a bottle. If you have blemishes, you may find that you still need some concealer as well. Even with some high coverage foundations you will still need a bit, so be prepared with that if you have blemishes to cover. My personal favourites at the moment are the Ellis Faas Concealer for under the eye/around the nose (go for the shade light than your own skin tone if you want to use it to highlight) and the MAC Studio Finish Concealer for blemishes. I’ve found both of those concealers to work great alongside the Skin79 Beblesh Balm too. Longevity wise, this stays put all day. I also haven’t needed to touch it up at all since I’ve been using it on a daily basis. I do use a powder over the top (the Guerlain Meteorite Pearls) but I haven’t been using a setting spray like I would normally. In regards to the packaging, one of the downsides is that you cannot see how much of the cream is left. However, I have used other products that have the same type of packaging and I have found that you can sort of dismantle it a bit to check the amount remaining. To do so, you have to pull off the gold cap part on the top, and then the bottle that holds the product inside the actual main bottle should be able to come out, and there you can see what you have left. I say this, but I haven’t yet tried it with this particular product because with some bottles like this, it can make it difficult to put back together again. I don’t really recommend doing it until you feel that you are near the end of the product and want to check, purely just incase it would be one of those products that don’t go back together so easily. So overall, do I like this Beblesh Balm? Yes. Yes I do. I really do. I love it a lot. It has such fantastic coverage and it really helps to streamline and simplify my makeup routine on a casual day to day basis. I would probably find myself still reaching out for foundation for things such as going for dinner, or a night out, a wedding etc., but for my casual every day routine in the life of a mum? This cream is so perfect. It is so easy to apply, lasts all day, helps me to look less fatigued and is so minimal fuss. I highly recommend this cream, especially to mums. If you want to get your hands on the Skin79 Super+ Beblesh Balm Hot Pink, you can find it at Look Fantastic. Look Fantastic also frequently have discount offers available so that you can very likely get some money off too. What are your thoughts on the Skin79 Super+ Beblesh Balm Hot Pink? What is your favourite BB Cream?